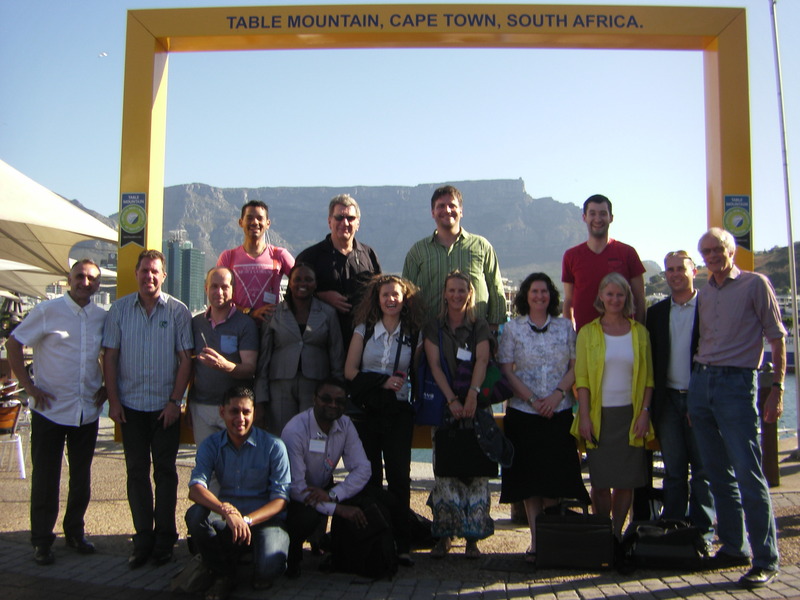 The Graduate Network on Global Open Education (#go_gn) held its first interdisciplinary PhD seminar in Capetown (South Africa) from December 7-13th, 2013. Thanks to the kind invitation extended by Fred Mulder, I was able to join on short notice for an intense five days of discussing research proposals with a diverse group of researchers, instructors and scholars in the field of Open Education Resources (OER). The Go-GN seminar was held in conjunction with the Research on Open Educational Resources for Development (ROER4D) steering group conference and the openAir Global Congress on IP & the Public Interest directly on the city’s beautiful Waterfront district, with acronyms aplenty. Go-GN is a global graduate program aiming to unite junior researchers working on a PhD in the OER field. Members remain enrolled in their home university’s doctoral program, and may gain up to two additional thesis advisors or mentors from the Go-GN network of sponsors. In addition, biannual research colloquia give an opportunity to present and discuss works in progress. Especially inspiring I thought was the exchange with both practitioners and researchers across various fields, making clear that impact of OER and MOOC in the Global South has just begun to be felt. Where the European discourse can often seem defensive and outright skeptical when digital formats are compared to on-campus teaching, it is obvious that the perspective shifts radically when the European brick-and-mortar infrastructure is lacking entirely. Not only does the critique of digital formats for teaching and learning suddenly seem a bit out of touch, it overlooks a decade’s worth of research results demonstrating the immense potential for education and development using open resources and open practices. I freely admit, that I too have much to learn here. While my own research attempts to answer precisely the question how MOOC can contribute meaningfully to Higher Education in Germany, the presentations of my fellow PhD encompassed the entire spectrum of the field and proved to be both insightful and moving. Succesful implementation of OER requires – to name a few examples – attention to the political processes advancing OER policies, questions of broader access to OER in education for example in Africa, and an examination of academic culture conducive to sharing artefacts as well as best practices. Video tapings of all presentations will be made available shortly via the Go-GN website. The Go-GN provides ample opportunity for topic-driven exchange with knowledgeable junior and senior researchers, a format that I have found to be extremely beneficial to my own thought processes and motivation. Joining with a related conference is also helpful – the second Go-GN colloquium will be in Ljubljana as a separate track within the Open Courseware Consortium (OCWC) annual conference – as it broadens the discourse into current research discourses for all of us. The entire week was of course overshadowed by the recent death of Nelson Mandela, and it felt like a very special and tender moment to be in this vibrant, awe-inspiring country. While it is true that Cape Town’s urban amenities and especially its affluent Waterfront district are not quite what one expects of Africa – it certainly shared South Africa’s moment of grief over the loss of Madiba. Our hosts dedicated the seminar to Mandela’s legacy and his strong belief in the enabling power of education to achieve liberty and justice for all South Africans. 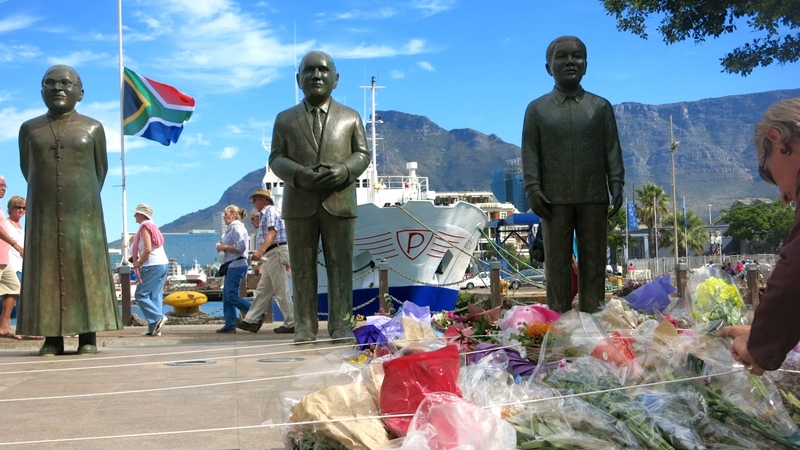 Flowers on the memorial at Cape Town’s Nobel Square, where a statue of Mandela and his fellow laureates stands in the middle of the vibrant Waterfront shopping district, honouring the father of the nation after his passing on Dec 5th, 2013.